We bought our first house in 1993 and so my wife wanted a big dog for it. And as she had worked as a vet tech for a number of years she knew what large-dog breeds she wanted to check out (like Dobies...with undocked ears, thank you). Greyhounds, either the AKC or the NGA kind, weren't even on the radar. Shortly after we moved in I read a newspaper story profiling a woman who had adopted a retired racing greyhound. As we had errands to do that day we visited the pet store where we met the woman and her hound Willow, as well as others who were present with their dogs. We spent over an hour chatting with her, then left to do our errands -- only to bump into her and Willow again at a store later that afternoon. We decided shortly thereafter that we'd get a greyhound. Three weeks later, having applied and been approved to adopt a greyhound by a local greyhound adoption group, we drove to La Mesa, CA, and were presented with three greyhounds as potential pets. We chose a white, ears-with-missing-tips, black-spotted (called "ticking") greyhound that our daughter named "Alex." He came from Oklahoma and ended his racing career at the Agua Caliente racetrack before he turned four years old. His breeder was so happy to hear that he'd been adopted and remembered him because of his unusual black eyebrows. There is no breed of dog quite like the retired racing greyhound with its blend of speed, athleticism, elegance, and goofiness. I try to convey that in my photographs. 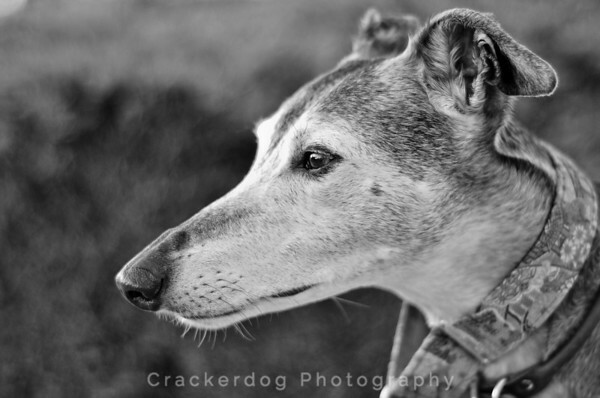 Twenty-plus years and six greyhounds later I combined my love of photography and this special dog breed. While I usually do private photo shoots at customers' homes in Los Angeles and Orange counties I also travel to greyhound events in Solvang, CA, Dewey Beach, DE, Gettysburg, PA, and San Antonio, TX and do sessions with greyhounds there, too. I hope to add more events in the future. While most of my subjects are greyhounds, I photograph other dog breeds. Regardless of the breed my goal in each session is to capture the uniqueness of your pet. If my images put a smile on your face or cause you to relive a good memory, then nothing could please me more.